I like lowered trucks, I like old VW's and I like JDM wheels; this MK1 Volkswagen Caddy really brings all three together really well. 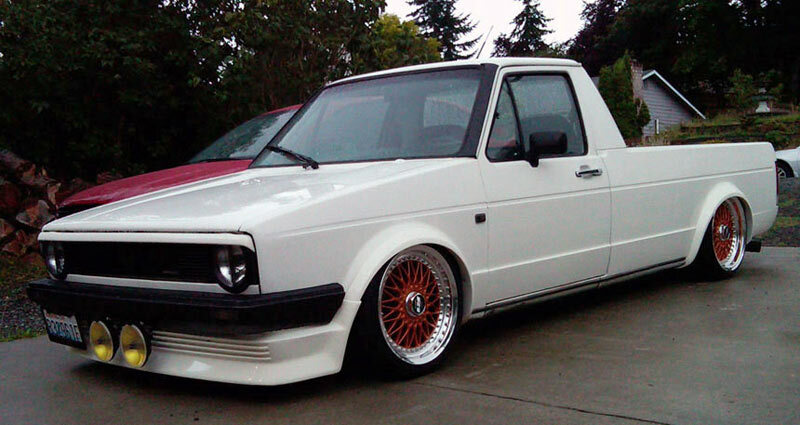 This VW Caddy is slammed nice and low on a rare set of Impul R1 wheels. The Impul R1 Wheels are 16×7 in the front and 16×8 in the rear. The metallic orange really pops against the white paint of the Caddy. Impul R1 Getting refinished, really clean! The front end has been converted to round headlights, and has been retrofitted with HID Mini Projectors. Front Air Dam, Hella Fog Lights and hood spoiler are nice touches.